My New Lasagna Recipe | Hapa...Shot the Food! Dan: When are we going to have lasagna again? I groaned, knowing that making a batch would be both labor and time-intensive for me… the latter intensified to a degree since I’m a slowpoke in the kitchen. We agreed that I would make a batch during one of my long weekends off from work during the holiday/winter break. I also didn’t internalize our old lasagna recipe well enough to do it from memory… it was on the hard drive of my now-dead tower computer. 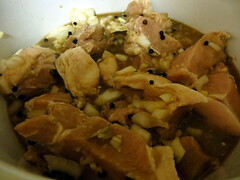 I had to find a new recipe, preferably something relatively healthy. 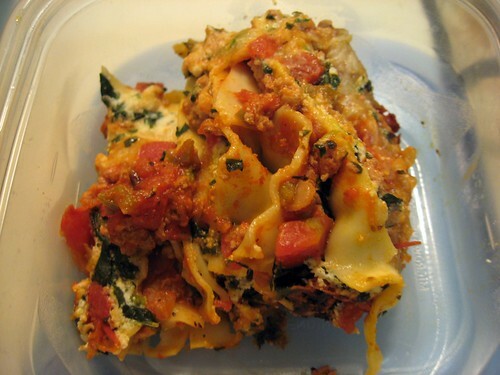 In my previous recipe, I had swapped a few ingredients to make it healthier: substituting non-fat ricotta and 2% mozzarella for the cheeses, using lean ground turkey and whole-wheat lasagna noodles. This recipe caught my eye since it was low-fat, low-calorie, and loaded with veggies, but I was a little worried that Dan wouldn’t like it because it contained bell pepper. 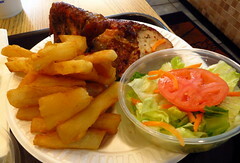 2) Spray a skillet with nonstick cooking spray and heat until hot over high heat. 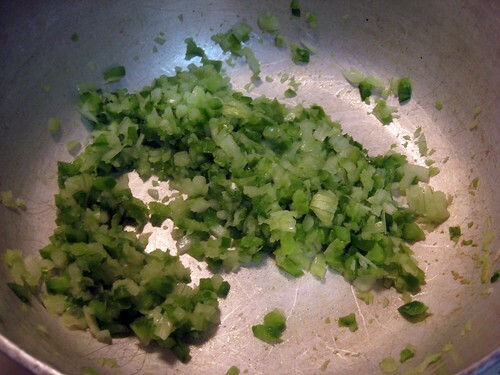 Add the chopped onion and green bell pepper and cook for 3 minutes, stirring occasionally. 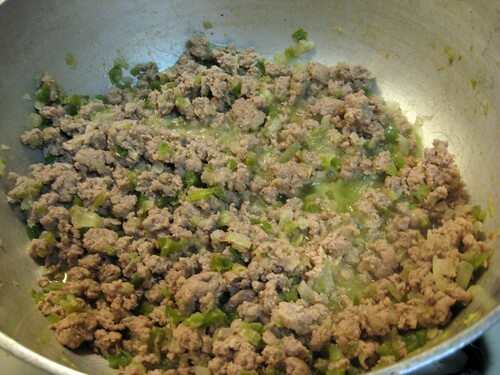 3) Add the ground turkey and sauté until browned and cooked through, about 5 minutes. Stir frequently. 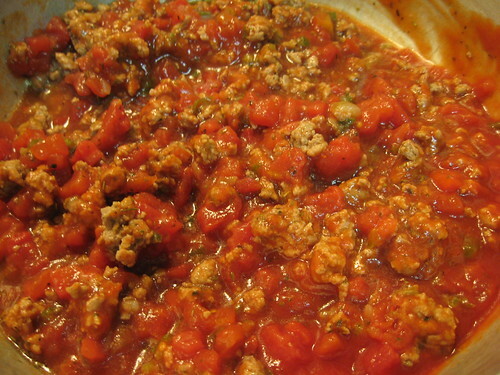 4) Add the Italian seasoning, diced tomatoes (with the juice from the can) and the tomato sauce; stir to combine and bring to a boil while stirring occasionally. Remove from heat and season to taste with salt and pepper. 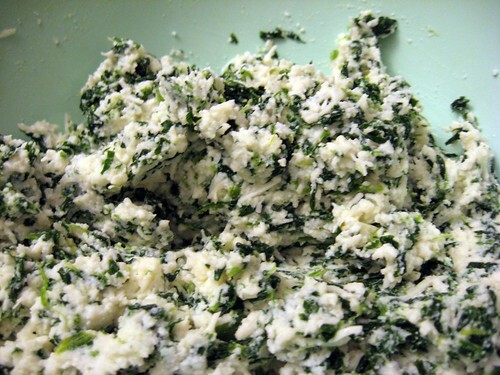 5) In a bowl mix together cottage cheese or ricotta, 8 ounces of shredded mozzarella and chopped spinach. Stir together and season with salt and pepper. If you want to include nutmeg, add in a pinch of it. 6) Spray pan with nonstick cooking spray and spread 1 cup of the sauce (from Step 5) across the bottom of pan. 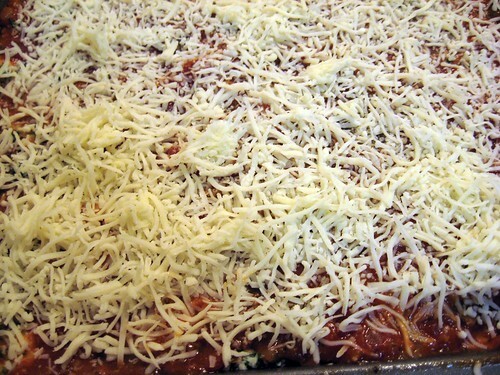 7) Add 4 lasagna noodles on top of the sauce. Spread 1/2 of the cottage cheese mixture (from Step 6) or ricotta mixture over the noodles. 8 ) Top with 4 more lasagna noodles, spread 3 cups of the tomato sauce (from Step 5) over noodle layer. 9) Repeat Step 8 and top with the remaining 4 noodles. Top with the remaining sauce and remaining mozzarella cheese. 10) Place lasagna pan on a cookie sheet in the oven to prevent it from bubbling over onto the oven floor. 11) Bake at 400 degrees F for 45 minutes until hot and bubbly. Let pan cool 5-10 minutes before cutting and serving. I think I might have toasted the cheese a little too much. 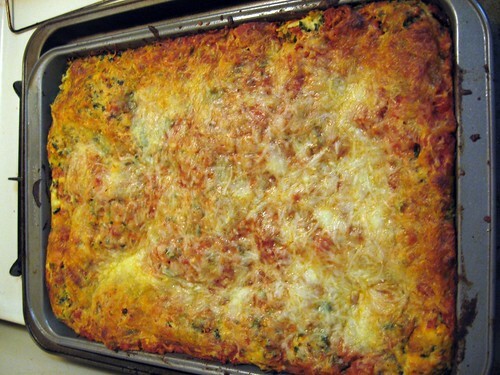 The lasagna looked very colorful, once cut, though..
Another look at the finished product… Yum! Yep… we found our new lasagna recipe! Final notes: Using ready-to-bake lasagna noodles cut out a lot of the prep time (Haven’t found them in a whole-wheat version at Giant yet). We will probably need to get a food processor at some point, too…Dicing veggies finely by knife takes an insane amount of time and labor, and while our blender can cut veggies as finely as we need, it extracts a lot of veggie juices (even while using the “chop” function). 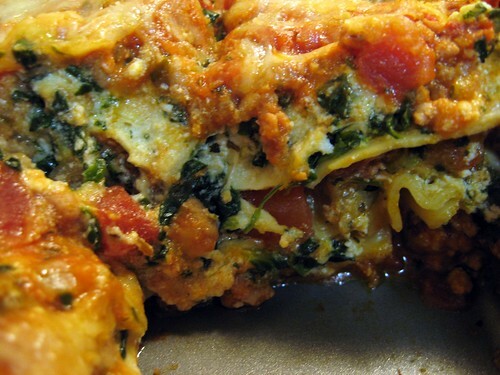 Posted on January 18, 2010, in recipe, Uncategorized and tagged healthy, lasagna. Bookmark the permalink. Leave a comment.